Separated by a skinny stretch of Puget Sound called The Narrows, not so long ago, a visit to Gig Harbor from Tacoma required a boat trip. In 1940 the first Narrows Bridge, nicknamed Galloping Gertie, linked Gig Harbor to Tacoma, but it really put the harbor on the map when the bridge collapsed in 1950. These days, two Narrows Bridges span the Sound, providing quick and reliable access for visiting and commuting. 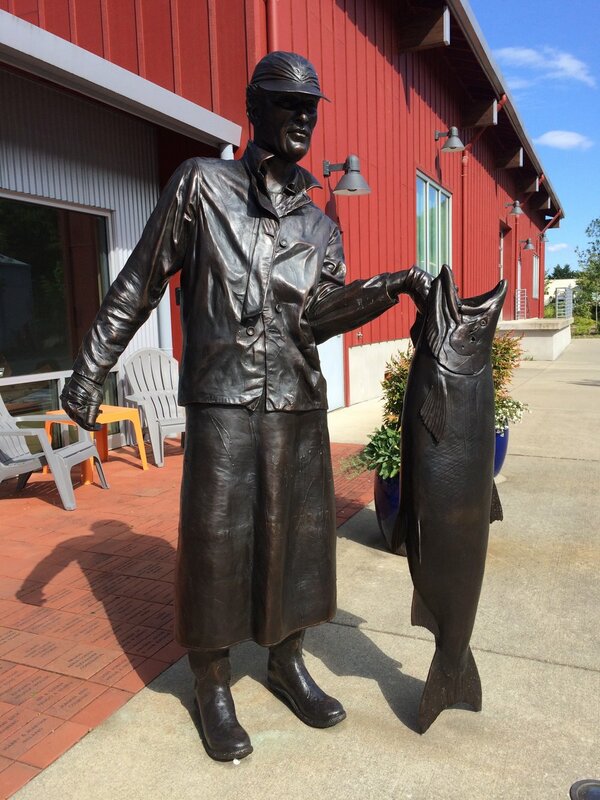 Cross the Narrows from West Tacoma and you're in the Maritime City, historically a fishing village that also offered opportunities for boat building and lumber work. Now its both a quaint tourist destination, and popular place for families and boaters to settle. Known for postcard views of Mt. 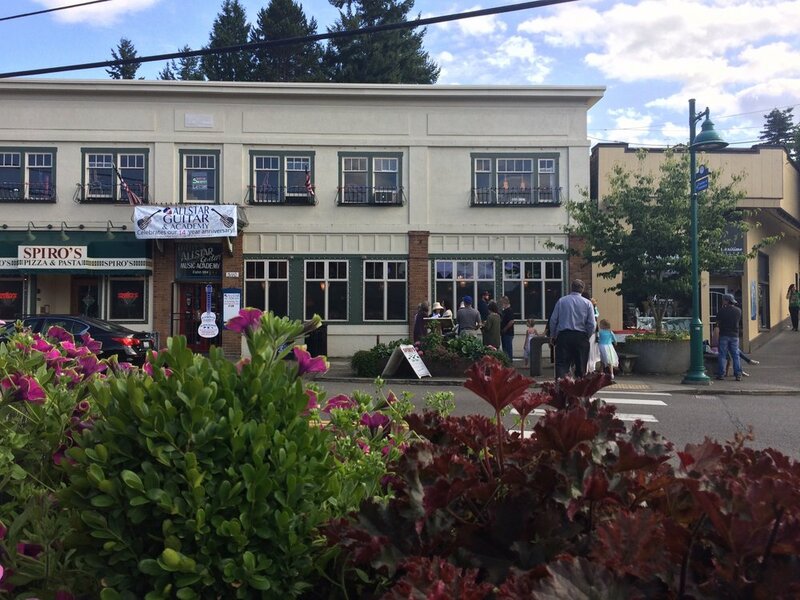 Rainier, a line-up of cafe's, galleries, pubs, breweries, and local history, Gig Harbor maintains much of its nostalgic charm downtown, while expanding into new inland shopping areas and neighborhoods. Waterfront sidewalks, populated with walkers and joggers, are also dotted with Heritage Markers illuminating the history of the harbor. Summertime brings free outdoor concerts, movies in the park, and the 7 Seas Brewing Anniversary Bash, while highly rated public schools, as well as Tacoma Community College's Gig Harbor Campus keep students and families in the harbor year round. 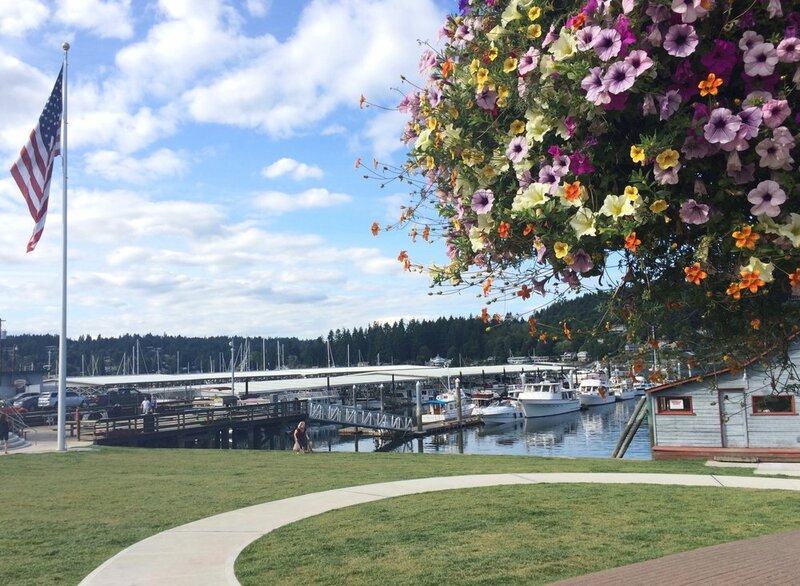 Marinas, parks, and restaurants, as well as beautiful historic and modern homes skirt the shores of Gig Harbor Bay. Bring your boat, take a tour, or rent a paddle-board. Gig Harbor offers all kinds of ways to get into the water. 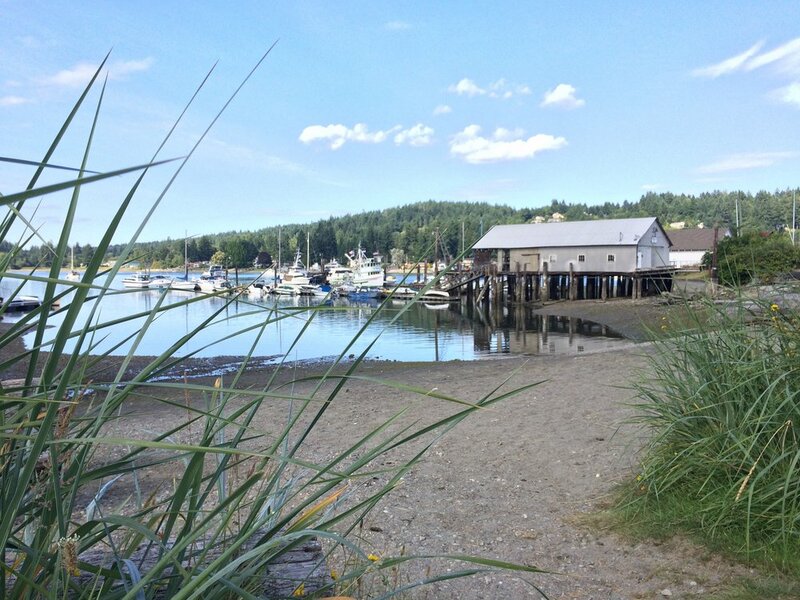 This grassy park adjoining the Jerisich Dock offers restrooms, beach access, a covered pavilion where you might catch some live music, as well as the historic blue netshed and home of the Skansie family. The Harbor History's Museum's mission includes creating "opportunities to experience the heritage of the greater Gig Harbor communities" through educational programs such as the immersive Pioneer School Experience as well as exhibits and their own library. You can spy dozens of birds, fish, mammals, and mollusks in this epic sculpture by chainsaw artist Jeff Samudosky. The Harbor History Museum is undergoing a restoration of the Shenandoah, a 65-foot purse seiner, donated by Tony Janovich. Neighboring the Harbor History Museum, this pretty park offers a picnic table and human-powered watercraft landing. Bring the kayak! A group of singers performs outside Spiro's Pizza & Pasta on a sunny July evening. Another great place to launch a kayak, canoe, dinghy, or paddle board on Gig Harbor's waterfront. Around here, we just call it "The Tides." Locally famous for its up-front water view, seafood, burgers, and a fun happy hour. JW @ The Boatyard offers outdoor seating and everything to eat from ice cream bars and corn dogs, to fish and chips or a lobster roll. Dig in! 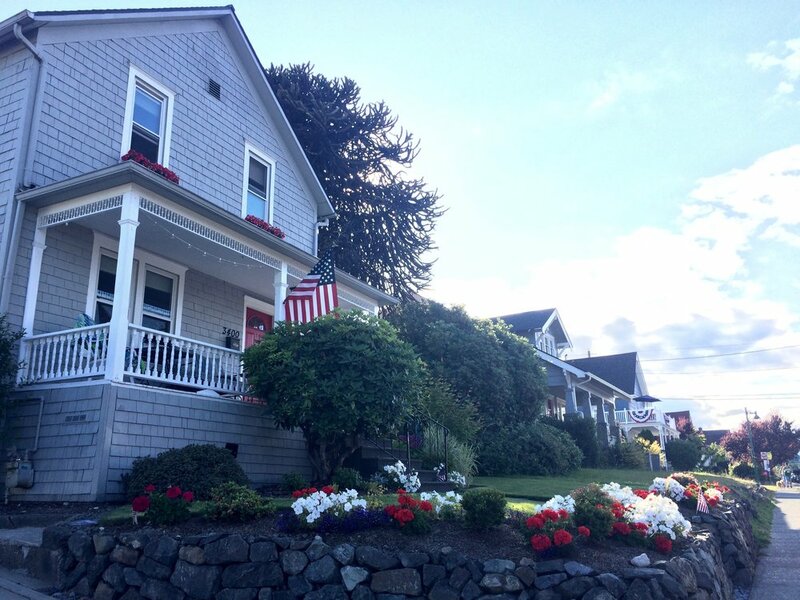 Walk the waterfront in Gig Harbor and you can't miss the beautiful classic homes tended with care. The art festival spread all over waterfront sidewalks and downtown parks with friendly chalk art. Welcome to Gig Harbor! 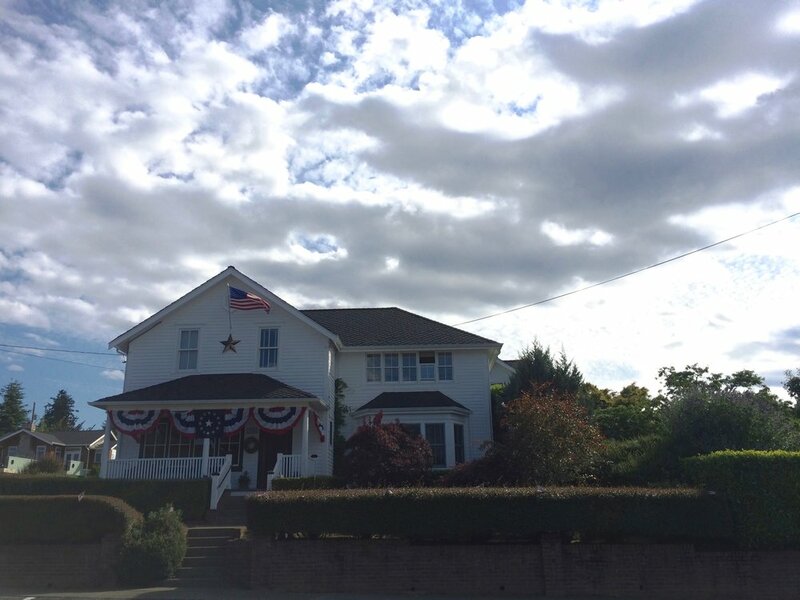 Walk, jog, or drive the Harbor waterfront and enjoy the old-time homes decked out for the 4th. 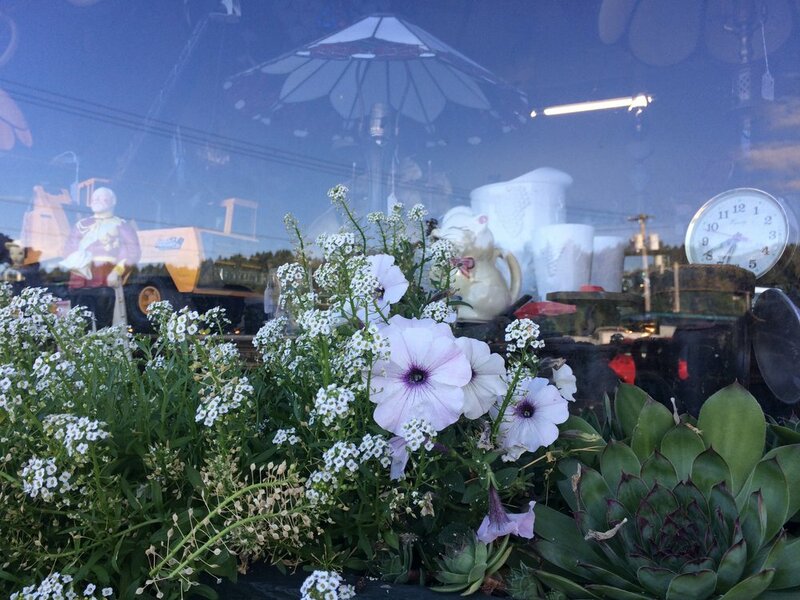 Pretty window boxes and enticing antiques at Pickers Northwest Antiques, next to El Pueblo and the Gig Harbor Book Company. Walk the gravel path from the Harbor History Museum to Donkey Creek Park and you may see wild Queen Anne's Lace and sweet peas growing the shaded banks of North Creek. If you know the Harbor, you know Finholm's. It even has its own district, the Finholm Market District. Local artists Lita Dawn and Bob Henry recreated this historic mural on the front of the business in 2015. Susanne's Bakery has been filling the Millville District in downtown Gig Harbor with the aroma of fresh baked goods since 1997. Catch the trolley here, and pick-up the Gateway, Gig Harbor's local paper, will you munch a scone. Tucked into the northwest corner of Gig Harbor, this marina is a nice place to watch boats and view homes on the hillside.